Have you ever been in a situation that required a long wait while out and about with kids? Maybe you were stuck in a slow line at the post office, a restaurant, or a delayed doctor appointment. These long waits can be excellent opportunities for building math skills, and we’ve come up with three mini math activities that are easy to use in a pinch! Items like dice, decks of cards, or coins are all easy to find at home and small enough to carry in a purse or backpack. After reading this article, we are confident you’ll never want to leave home without them. Here are some of our favorite mini math activities for families on the go. Each object can be used flexibly to meet a range of ages and skill levels. Dice are one of the most portable household objects and are easy to find in board games. If you have a game closet that is gathering dust, raid it to find a few pairs of dice to keep in your purse pocket. 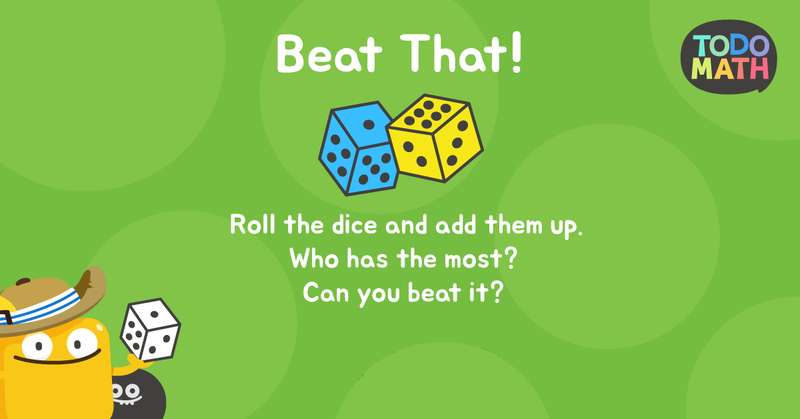 During the next long wait, take them out to play a quick game of Beat That! Roll the dice to make the largest possible number (a six and four would be sixty-four). Pass the dice to the next person and see if they can beat it! This game is ideal for ages 5+ to learn the concept of place value. One of our Todo Math moms created an online activity guide hosting a variety of math card games for kids. In the game called Addition War, players pull two cards from the deck and add them up. Face cards can be removed in advance or assigned values of 10+. The player with the largest sum collects the cards for that round. Play until the deck is gone, and the player with the most cards wins. The game can also be played using multiplication. Counting money is a universal skill that can start at a very young age. Most of us have spare change lying around in our cars, purses or pockets. Collect the change and spread it out. Name a price, like twenty cents. Can twenty cents be made out of the coins available? If not, which amount comes closest? Counting money has many variations. You can also start by sorting coins into random groups of three. Which group has the most money? For example, three dimes have more value than three pennies. When in doubt, count up the total together to see if it will buy something fun, like ice cream! We’ve assembled a Pinterest board to collect ideas for homemade math manipulatives and games. Visit the board for inspiration on household objects that can be used for building math skills. In addition, one of our Todo Math moms in Korea has assembled a catalog of creative videos for practicing early elementary math. Take a virtual trip to our Korean Facebook page to check them out! Ready for more counting games? Don’t forget to download Todo Math for FREE on the iTunes and Android app stores!